Castle Rising lies close to the Wash in West Norfolk. It is a largely agricultural region, but is more wooded than most of Norfolk. 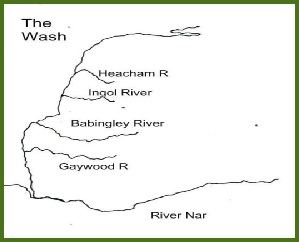 Five rivers flow west into the Wash, from the Chalklands and Castle Rising village is on the southern slopes of the Babingley River (the most navigable of the five) which was an important source of both power for water mills and sea access. In former times an inlet of the Wash brought the sea much closer to the village than it is at the present time. 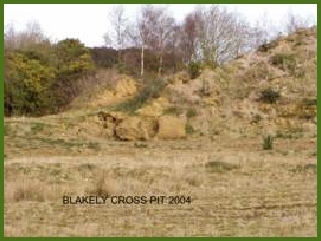 Above, and further from the coast, are the Leziate Beds, which comprise a variety of rock types including a reddish sandstone, known locally as Small Carr a stone which was quarried for at least 300 hundred years in a small pit in the south-east of the parish. It provided the attractive building stone, which was used to build many of the older cottages in the village. Much more recently (within the last million years), the area was extensively glaciated and the large ice sheets which spread over the land, depositing huge quantities of glacial material, such as clays and gravels. During the Roman occupation of Britain, there was a major rise in sea level resulting in more recent marine deposits. These have resulted in a wide variety of different soils in the area, some highly fertile and others much less productive. The Babingley Valley itself has been subject to flooding from the sea even within the last 2000 years, although due to major 19th century engineering works in King’s Lynn and land reclamation the sea is now more than 5km from the village. From the Norman period until Tudor times, the whole area from King’s Lynn to Sandringham and inland to Hillington, was set aside as a Royal Chase and so agricultural activity was restricted mainly to the Babingley valley. There were extensive commons which prior to enclosure on which the local villagers had the right to graze their animals. These have now been incorporated into the Rising Estate. There are still two ancient woodlands (Millwood and the Alder Carr) within the parish. These were managed to provide building material and forest products for the estate.